the fee I thought was always between 200 to 300 was I wrong? is there a bank with less fees? Which Bank do you recommend for fixed rate of intrest. Moving to the Banking forum for knowledgeable advice. The K-bank international receiving fee is 0.25% (Bt200 min, Bt500 max) which is the typical Thai bank international receiving fee. Maybe an intermediary/correspondent bank fee also occurred. 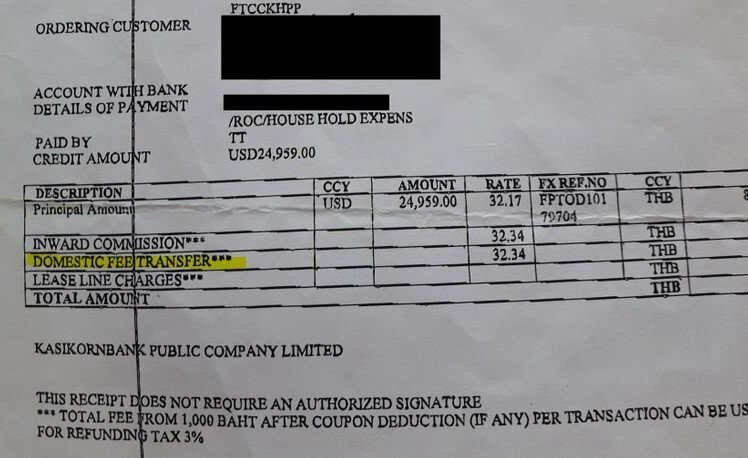 On top of that K-Bank charged me up to 750B to move the money from Bangkok main office to Pattaya branch. No such robbery at Bangkok Bank, where 500B max means 500B max. Thank you for that Pib and sorry for for my late reply no excuse. There has never been an intermediary/correspondent fee that I know of before only difference the branch I always used before closed and now having to use another branch further away. hopefully I will be able to keep better check.